Given that we don’t yet know whether a planetary core exists within Jupiter, much of our understanding of giant planet formation comes from a different line of investigation: the bulk composition of the planet. The composition of the atmosphere that we observe today results from a combination of many processes – chemistry initiated by the Sun’s UV rays, condensation of gases to form cloud decks, and dynamic weather causing the mixing and transport of materials from place to place. Nevertheless, Jupiter’s immense gravity means that all this chemistry is determined by the original balance of chemical elements and isotopes. The materials that the young Jupiter captured from the protosolar nebula were never allowed to escape. Jupiter can then be thought of as an ideal time capsule, revealing the processes that formed this gargantuan world billions of years ago. Why is this important? 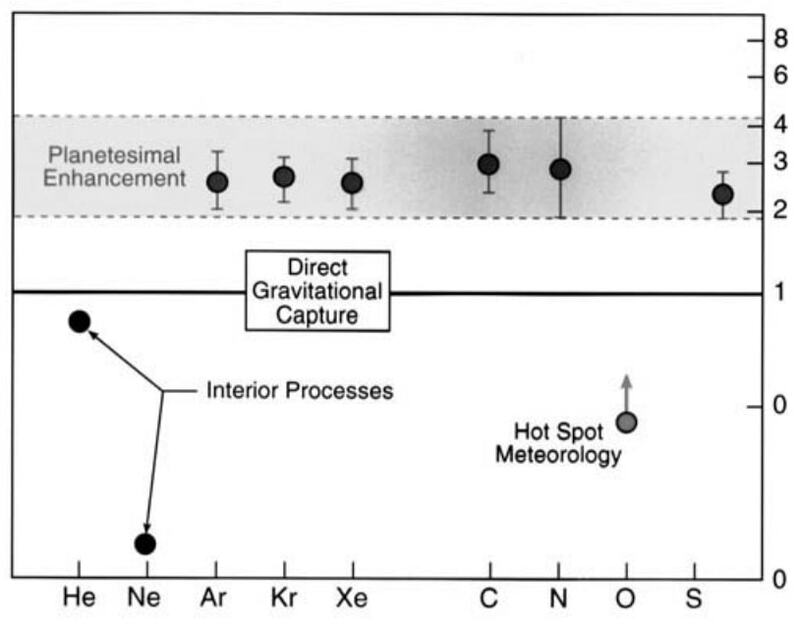 Well, different theories of giant planet formation predict a different balance of elements and isotopes. By creating a precise inventory of Jupiter’s composition, it might help us distinguish between those competing ideas. For example, if Jupiter’s formation didn’t require a core, and simply started from a collapse of the nebula gas that surrounded our young Sun, then we might expect Jupiter to have the same sort of inventory as the Sun itself. Conversely, if Jupiter did require a core for the formation to begin (core accretion theory), then that core material would have helped to enrich the planet in elements, over and above what we measure in the Sun. There are a couple of ways to determine this compositional inventory. Remote sensing, using spectroscopic measurements of the soup of gaseous species from ground-based telescopes or visiting spacecraft, is one potential method. Each gas has a different spectral signature, so provided the gas is present above the cloud tops, we can determine the composition by modelling the spectra. This has been done for all four giant planets (although it’s really hard to do on the ice giants), and the general picture that has emerged is that the elements and isotopes are enriched with respect to conditions in the Sun. Place a tick in the box for core accretion theory. However, the upper atmosphere represents only a tiny fraction of Jupiter’s enormous bulk and might not be representative of the rest of the planet. 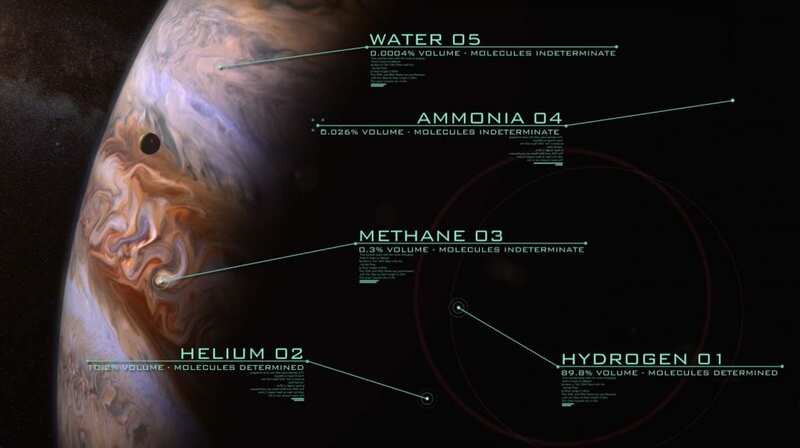 Indeed, some species like ammonia and water condense out at the cold temperatures of Jupiter’s upper atmosphere, forming the primary cloud decks. The main repositories for these condensable species are therefore hidden from view, down below the cloud decks. So lots of the species we’re interested in are inaccessible to us. A better way of measuring the composition below the clouds is by firing a probe into the planet itself, with sophisticated instruments designed to sniff out the gases and aerosols present at levels hidden from view. That’s precisely what we did in 1995 with the Galileo probe, which descended under a parachute for 60 minutes, reaching down to the 20 bar level, deep below the expected cloud layers. But there was a problem. The cloud decks weren’t where they were supposed to be, and, crucially, the amount of water measured was much lower than expected (about 490 ppm, or 30% of the amount found in the Sun). With only a single probe measurement, we fell into the trap of a Jovian hotspot, a dry, desiccated region of air just north of the equator where all the gases appeared to be depleted by powerful downwelling motions. It was like trying to infer the abundance of water on Earth if we only had one measurement from the Sahara desert. The Galileo probe did, however, measure enrichments in most gasesous species that were above the solar values. So, another tick for core accretion theory. However, the abundance of water remained a mystery. Step in Juno, with its microwave radiometer on board, the first every flown to a giant planet. At microwave wavelengths, we sense light emitted from extremely high pressures down to 100 bar or so, well below the levels sampled by the Galileo probe, and well below the expected cloud decks. Here, water should be well mixed, allowing Juno to definitively constrain the water abundance in Jupiter and hence the amount of oxygen mixed into the giant planet as it was forming. Oxygen is key, as core accretion theory would expect it to be similarly enhanced over the solar abundances, maybe by 400-1000%, depending on the details of the formation model. Indeed, one theory involves water ice cages trapping gases (like methane, ammonia, nitrogen, etc.) in the early solar system and delivering them to Jupiter. If that’s the case, then we should find more oxygen (from those original water ice cages) than the other gaseous species. The precise water abundance has the potential to rewrite the textbooks on how Jupiter first formed, and to complete the task that was left over from Galileo.